*Photo supplied Good Cause: Gavin Carter and Toby Butterfield perform as seniors on a rather strange date at Docksiders — part of the fundraising show on July 17 and 18. Comedy group Imrov Bermuda will raise both laughs and funds this year as part of its Imrov Comedy Cup Match event. The show will raise money for Impact Mentoring Academy which helps young boys who need extra academic support outside of school. Two teams —St Gorgeous and Stunnerset — will battle it out with on the spot Cup Match comedy. This show usually translates to a PG14 rating. Money will also be raised Tor the Family Centre and the BMDS Charitable Trust. The event is on July 17 & 18 at Daylesford Theatre. We spoke to organizer Toby Butterfield ahead of the show. 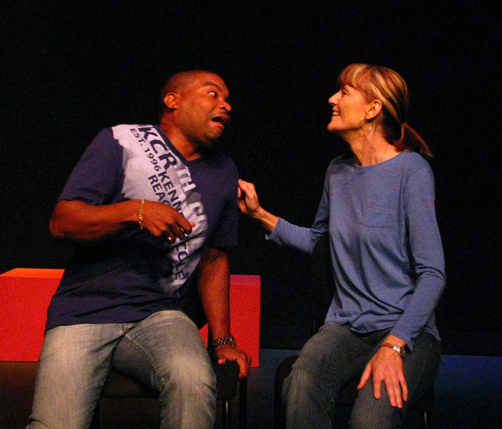 Why have you taken on this cause to support through your Improv events? Impact is a very special school and it needs help so that it can grow. My support started five years ago when I bumped into the principal, Trace White and we began talking. There we were in the grocery store and we talked for over an hour about improving approaches to conventional education. We just clicked and it was very inspiring. I specialize in teaching adults but from that time on I wanted to teach at the school. I really wanted to have the boys get the benefits of improv. I had to be patient though. For one reason or another we couldn’t make it happen until this year. Having taught the boys now, I am even more convinced of the necessity of the school so it was obvious I needed to choose them as one of the recipients of our Cup Match Show fundraiser. How many boys use the IMPACT Mentoring facility? Last year there were 18 boys enrolled between the ages of 13 and 18, and next year it is likely to be as high as 25. There’s a lot of demand because it is unlike any other school. Impact is boys only and it serves their needs in ways that other schools aren’t able to. How do you go about teaching improv to the school children? Hmm, well first you might be wondering how can improv be taught period. I know teaching improv sounds like an oxymoron. I use games and exercises that are fun and let students work on one element at a time, it’s done gradually because all at once is too much. It is absolutely essential to create an atmosphere of playfulness and safety so students don’t fear making mistakes. The boys don’t struggle with this as much as adults do. With just a bit of reassurance they will express themselves spontaneously and in every class they surprised me with their creativity. It’s so easy to underestimate teens but they are so capable. One example of an exercise is I get them to pair up and then speaking just one word at a time, back and forth, they tell an original story. This is instant collaboration. There’s no way to plan and it only works if they really listen and work together. How have they taken to it? The games and exercises are really fun so that helps! We laugh a lot. Most of them really shine when given the chance and they learned that they had to rely on each other to do that. In improv you can’t look good unless someone else is making you look good by supporting your ideas. I think they appreciated the “rules” of improv, the atmosphere, in which they knew their ideas would be supported and used by whoever they were working with at the time. I kept pointing that out in class because I know it’s such a valuable thing and an atmosphere that is rare in the world. From me they would get recognition for taking risks and for supporting each other’s ideas. How do you believe it has helped them? It wasn’t long after I started that they gave me warm welcomes and showed trust in me, and as teachers will tell you, that’s a good sign. I think the main messages they got from it is that they are each creative, capable individuals and that they can achieve big things if they work together. These messages are echoed in many other ways at the school so I just emphasized that. The pay-off will be even greater when go back next year so they can keep developing. As for this week, a couple of the boys will be ushers at the show. Describe the Improv show coming up this week. It’s a ridiculous and fun combination between Cup Match and TV’s Who’s Line is it Anyway? And it’s all for charity. We borrow from the Cup Match tradition by having the east/west rivalry. In our case it’s St Gorgeous v Stunnerset! We perform scenes based on suggestions yelled out by the audience and at the end they vote how many runs the scene should score. There aren’t too many things Bermudians enjoy more than supporting their Cup Match team. For the last two years we’ve had the best audiences. They were rolling in the isles. We couldn’t believe how loud the cheering was! Proceeds also benefit the BMDS Charitable Trust and The Family Centre. Go to bdatix.bm for tickets, you get to choose how much you pay. If we have any seats left we will sell them at the door but people who tried that last year were disappointed because we were sold out.